Yes this has mostly been a parenting blog lately but as I mentioned in the renaming post there will be other content here and there. If you bear with me, I'm going to tie the whole thing back into parenting at the end. I promise. I recently ran a post about the trend of rugby referees wearing pink, which got some good response. 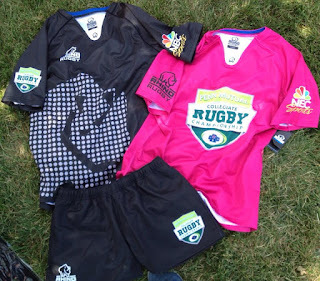 I promised a follow up from the Collegiate Rugby Championship 7s in the event that they also used a pink kit for the referees, and indeed they did. This means that three of the six jerseys I've been given this year have been pink. It makes sense for referees to wear pink. You need to have something that contrasts with what the players are wearing. This is especially important in sports like rugby and soccer where the referees kit is essentially the same as what the players wear, unlike in baseball or football where the official's attire is markedly different than that of the players. 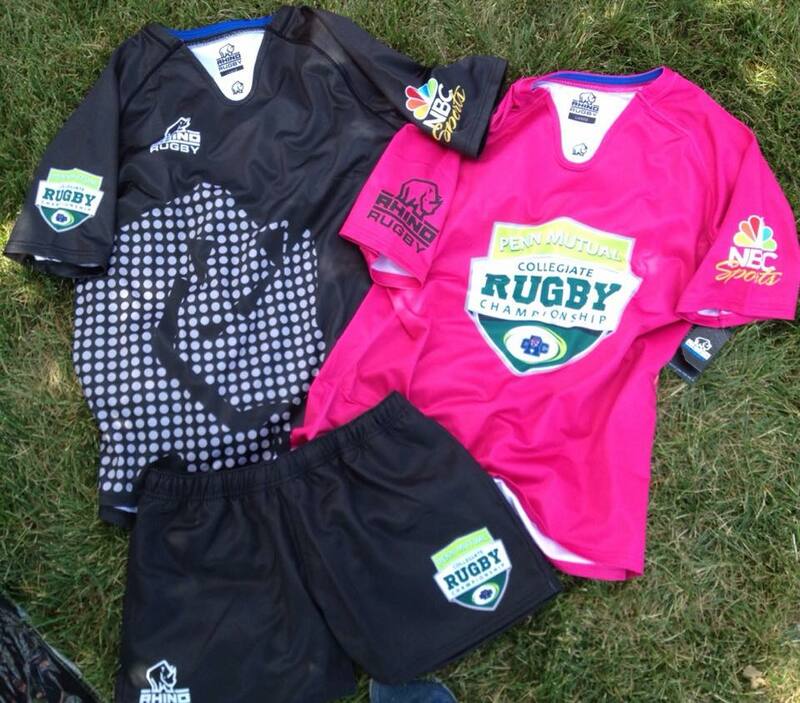 Still, pink can end up being too close to some reds or purples so the good people at USA Sevens Rugby gave out two jerseys with our kits. I think I only ended up wearing the black jersey one time during the weekend, but we were glad to have it when we needed it. Some of the other refereeing squads wore the black fairly often. Of course I was perfectly happy to wear the pink, which I am not ashamed to say I love. 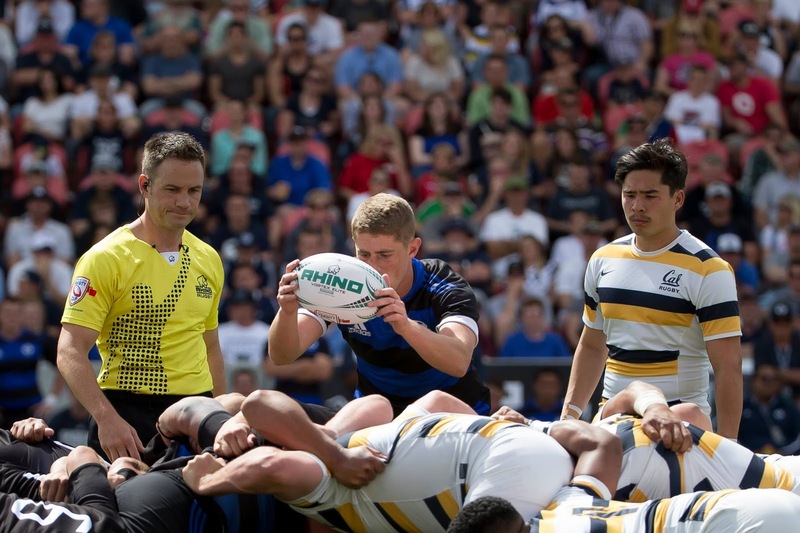 You may be able to tell the kits were sponsored and made by Rhino Rugby. Rhino made kits for most of the teams at the CRC as well. 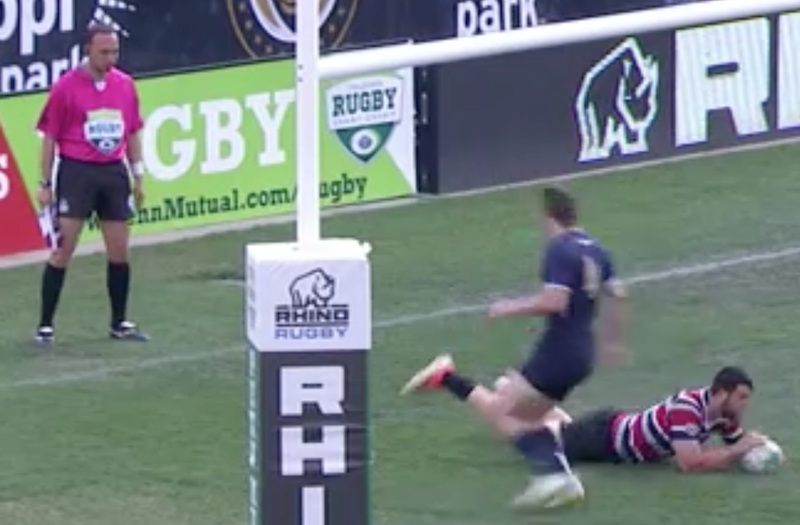 The dot matrix graphics are a thing at Rhino as you can see from the ref's kit at the Varsity Cup. 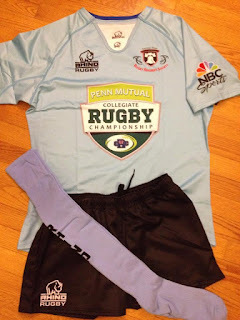 Penn Mutual is the new tournament sponsor. 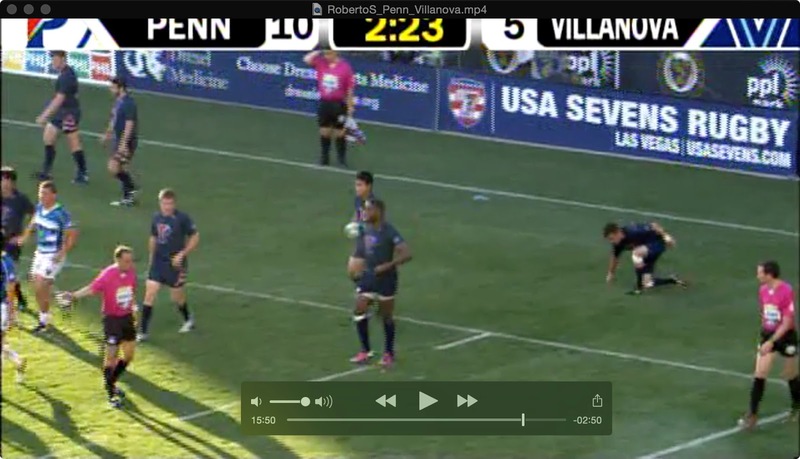 My only wish is that the USA 7s/CRC 7s logos were featured more prominently. CRC weekend ended up being huge for me in another way. In a small way I was able to finally fulfill the promise some saw in me when I started reffing. About nine years ago I was occasionally told, "You'll be on TV some day." I never believed it. I should have, but back then there was less rugby on TV and I didn't think I'd ever make it to the level of being an international ref, so I thought they were just being nice. The world changed when rugby was added to the Olympics. Suddenly it was possible for a ref to be on TV in the US. By that time I was a little older and due to circumstances and life choices it seemed I had been passed up by younger refs. I understand why. I don't begrudge anyone their opportunities. Over the last few years I've been content to take higher level assignments as a lower level assistant (sideline) referee, but I did secretly lament that I'd likely never do a televised game in a stadium as the center ref. Then I unexpectedly got an offer to referee a game in the stadium on Saturday. It wasn't a CRC match, it was a lower tier game in the City 4 Philadelphia Cup, a competition between four Philadelphia based universities. The game was on at 6:55pm and broadcast on Comcast Sports Net. In some areas it was preempted for hockey coverage and shown later on tape delay. I'm not sure if there were announcers. The video I have only has the stadium audio. But it happened. I did my TV game. As an added bonus I was an In Goal Judge for the Bowl Final on Sunday. 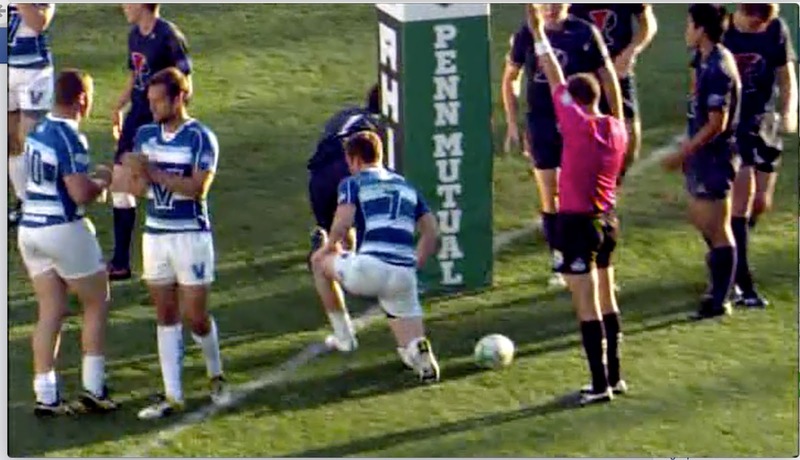 The game was broadcast on NBC so every time there was a try scored on my end I was on TV for a few milliseconds. I know the classy thing is to "act like you've been there before" and play it all off like it's no big deal. Maybe the real high level refs do that. Maybe I should be emulating it. But I think that for many of them it isn't a big deal. They expect it. They know it's going to happen for them. I don't. So it is a big deal to me. For me it reaffirmed what I had been telling myself and my kids for years. If you keep your head up and work hard you can eventually achieve what you set out to do. It doesn't help to complain or get angry. There were times when I felt like I wasn't getting the resources I deserved. I certainly wondered what other refs had that I lacked. I felt periods of frustration over the last few years. Instead of getting angry I asked questions. I watched the other refs to see if there was more to them than just youth (there was). I volunteered to help out whenever I could. I made myself available. I worked hard at improving my knowledge of the game and my physical abilities. 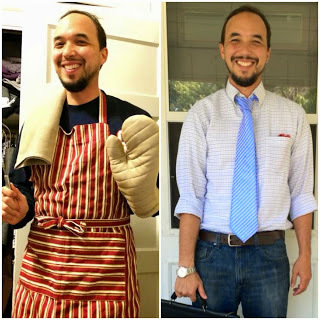 I also tried to find ways to ask for opportunities without sounding like I was complaining. I asked for things based on my own merits, not by comparing what I had to what others had. I did all the things I tell my kids to do. I'm 38. I'm old for a referee. The refs my age and older who do high level games were already doing high level games when they were younger than I am now. I may never get a center game on TV ever again. But I got one. I'm happy. It doesn't mean I'll stop trying to move up, but if this is it I'll be fine. If this is the only one I'll put the memory up on the mantle alongside my one hit, in my only at bat, in the only baseball game I ever played (an RBI single off a 60 year old Spaceman Lee). Mostly I'll have a real example to use when I tell my kids that hard work, showing up on time, and being polite really do pay off. I was also able to snag one of these cool sky blue alternates from the Eastern Penn refs, so double bonus.